This guide shows how to fix iTunes error 9 when restoring iPhone iPad or updating to iOS 12. "iOS error 9 when updating to iOS 12 - I've been having issues updating my iPhone. I keep having error 9 whether I use DFU or other methods. I've tried different iDevice cables and computers, but in vain." Some iTunes users have been reporting that iPhone failed to restore or update via iTunes, with a message saying that the iPhone could not be restored, an unknown error occurred (9). Dealing with iPhone error 9 in iTunes is never fun, but it won't be a tedious work. If you are troubled by the iTunes error 9, follow these steps to fix it. Free download iTunes alternative, MacX MediaTrans, to help solve iTunes error 9 when restoring or updating iPhone iPad to iOS 12 without data loss. The tool can quickly and easily backup and restore data for iPhone iPad iPod touch, including music, videos, movies, ringtones, books, documents and more. Fully support the latest iOS 12, iPhone X, iPhone 8/8 Plus. iTunes error 9 is a common iTunes error code appearing when users restore iPhone or iPad, update to iOS 12 via iTunes. "The iPhone could not be restored. An unknown error occurred (9)". It means your iPhones or iPads disconnects during the update or restore in iTunes. Before you learn how to fix iTunes error 9, look at common reasons why iPhone error 9 shows up in iTunes. iPhone could not be restored problem can also be noticed with iTunes error 14, error 4031, error 3194, error 2009, etc. If you have met this iTunes could not restore iPhone problem, or any other iTunes errors, you can go the fixes of full iTunes error codecs & unknown problems. 1. 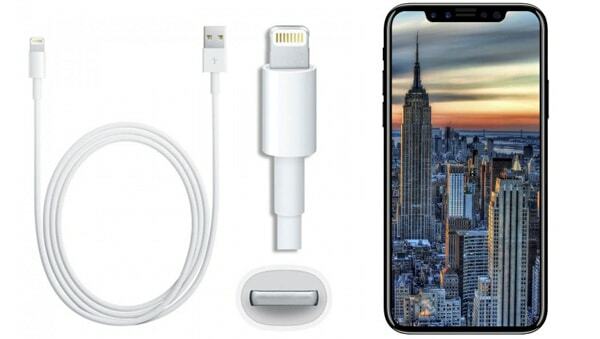 There's an issue with USB connection to your iPhone iPad. This is a typical reason. 2. Improper network settings on your device and computer. 3. Third-party security software blocks access to Apple update server. 4. Outdated iTunes version and other software can also lead to iTunes error 9. 5. Jailbroken iPhone is more likely to run into error 9 in iTunes. 1. One of the best iTunes error 9 solutions may be to do nothing. Wait for a few minutes and try twice more. 2. Make sure your iPhone is fully charged before you try to restore the device in iTunes. 3. Quit iTunes and reopen it on your computer. Update to the latest version of iTunes if you are using an outdated version, to do this, go to Help > Check for Updates on Windows, iTunes > Check for Updates on macOS. 4. Restart or reset iPhone. Learn what to do if iPhone keeps restarting. If you reset iPhone to factory settings, it's essential to backup your iPhone first. USB connection issue can cause iTunes error 9. On Apple's official support site, it suggests users to check USB connections. Use steps below. * Check if the cable connection is loose. * Unplug your device and then plug the device again and reconnect. * Remove third-party battery packs and cases from your iPhone to make sure that the USB cable is connected properly to the device. * Try to directly plug the cable to the USB port on the computer, instead of keyboard or USB hub. * Try another USB port or cable and restore/update your device again. 6. Update your Mac (check how to update to macOS Mojave) and PC. Then restart your computer and try to open iTunes to restore or update your iPhone iPad again. 7. Try to restore/update your device on another computer to see if iTunes error 9 is fixed. 8. Check third-party security software. Update, close or uninstall the security software to fix iPhone error 9 on iTunes. 9. Shut down any virtualization apps like Parallels, VMWare to resolve iTunes error 9. 10. Check outdated software and update software to the latest version. You can use iTunes alternative to get rid of iTunes error 9 when restoring iPhone iPad. MacX MediaTrans is a good choice. 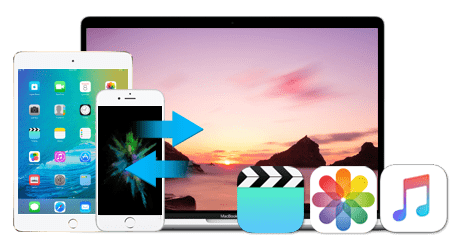 It can backup and restore data for iPhone iPad smoothly in a blazing fast speed, covering music, videos, ringtones, movies, documents, iTunes purchases, books and more. The tool also supports the latest iOS 12.3, macOS High Sierra, iPhone X/8/8 Plus. It's very easy to get started. Here we take photo backup and restore as an example. Step 1: Free download iOS manager tool on your computer and run it, connect your iPhone or iPad to computer with USB cable. Step 2: Choose a file type to backup and restore. 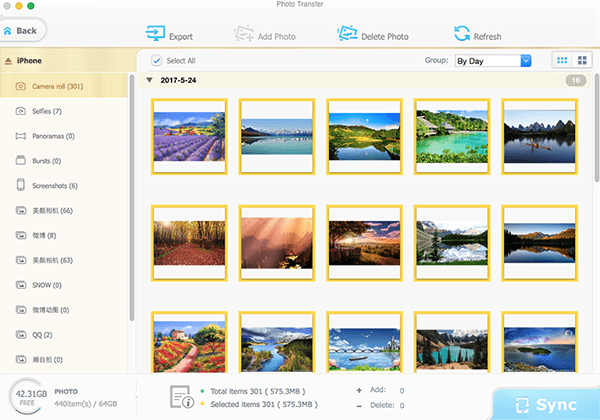 For example, click "Photo Transfer" to backup photos from iPhone to Mac/PC. Step 3: You'll see all the photos displayed on the left side. Selete photos you want to backup and restore, then click "Export" icon to transfer and backup them to Mac/PC. Connect your device to the computer, go to Photo Transfer > Add Photo, select backup from computer and click Sync to restore backup for your device. MacX MediaTrans, the best alternative to iTunes, can backup and restore data on iPhone iPad iPod touch without using iTunes. Thus you can avoid iTunes error 9 when restoring iPhone iPad via iTunes. Support the latest iPhone X/8/8 Plus, macOS High Sierra and iOS 12.